DCS391 CIRCULAR SAW INCLUDES TCT BLADE SIDE FENCE & DUST EXTRACTION ADAPTOR. DCS355 OSCILLATING TOOL. DCD796 2 SPEED COMPACT BRUSHLESS COMBI DRILL. DCF887 BRUSHLESS IMPACT DRIVER. DCG412 5" ANGLE GRINDER. DCN660 Brushless 2nd fix Nail Gun. Kit includes. DCB184 5.0AH BATTERIES X 3. DCL040 Torch. DCS355 Brushless Multi Tool. DCP580 82MM PLANER INCLUDES DUST BAG AND SIDE FENCE. 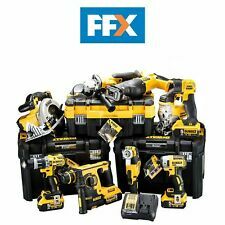 DCN660 2ND FIX NAILER. DCS391 CIRCULAR SAW INCLUDES TCT BLADE SIDE FENCE & DUST EXTRACTION ADAPTOR. DCS355 OSCILLATING TOOL. WILL ALSO INCLUDE A DCL050 WORKLIGHT. It is fitted with Milwaukee's patented FIXTEC clamp for fast and easy keyless blade change. 1 x 18 Volt 18 Volt M18 BP Planer is fitted wih a high performance 4-pole motor to achieve optimum surface finish. It has a super lightweight and compact design. 2 x 18V 2.0Ah Bluetooth Li-ion Batteries, pair with Apple and Android smart devices via the free Tool Connect™ App. 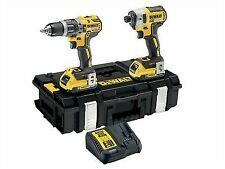 Compatible with all slide on DEWALT Li-ion 18V Tools. 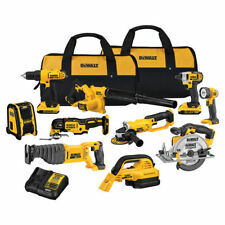 This kit features a drill driver, impact driver, reciprocating saw, circular saw, oscillating tool, grinder, right angle drill, Bluetooth speaker and work light. 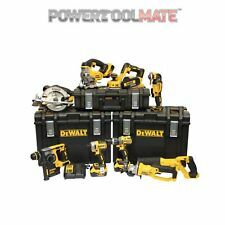 Dewalt DCK 940 D 2 20V MAX Cordless Lithium-Ion 9 -Tool Combo Kit. 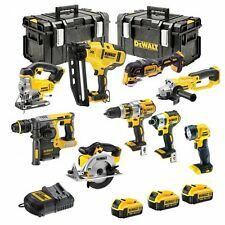 The DEWALT DCK940D2 20V MAX Lithium Ion 9-Tool Combo Kit contains all the tools you need for any/all projects! The DCF885 20V MAX Lithium Ion 1/4" impact driver features 3 LED lights with 20 second delay to provide visibility without shadows. Includes: M18 cordless lithium-ion 1/2 in. circular saw (2630-20), M18 cordless lithium-ion jig saw (2645-20), M18 1/4 in. hex compact impact driver (2650-20), M18 1/2 in. high-torque impact wrench with friction ring (2663-20), M18 cordless lithium-ion 4-1/2 in. M18™ Cordless Combination Kit. Series M18(TM). Item Cordless Combination Kit. Cordless Tool Battery Type Li-Ion. Corded/Cordless Cordless. Battery Capacity 3.0Ah. Number of Tools 9. NEW - BOX SEALED . 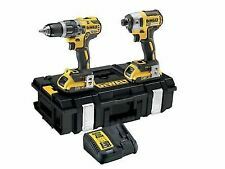 DCD796 18v Combi DrillFeatures & Benefits DCD796 18v Combi DrillSpecifications • 2 x Lithium ion batteries 2ah. DCF887 18v Impact DriverFeatures & Benefits DCF887 18v Impact DriverSpecifications. Hex compact impact driver (2656-20), M18 1/2 high torque impact wrench (2662-20), M18 HACKZALL (2625-20), M18 6-1/2 in. 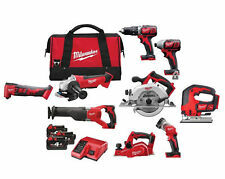 The Milwaukee M18 18-Volt Lithium-Ion Cordless Combo Kit (9-Tool) has all the tools you need to tackle a wide range of drilling, driving, cutting and grinding applications. The 2696-29 M18 Cordless 9-Tool Combo Kit includes the M18 1/2 in. Right Angle Drill (2615-20), M18 1/4 in. Hex Impact Driver (2656-20), M18 1/2 in. High-Torque Impact Wrench w/ Friction Ring (2663-20), M18 Sawzall Recip Saw (2621-20), M18 6 in. The 2696-29 M18 Cordless 9-Tool Combo Kit includes the M18 1/2 in. Right Angle Drill (2615-20), M18 1/4 in. Hex Impact Driver (2656-20), M18 1/2 in. High-Torque Impact Wrench w/ Friction Ring (2663-20), M18 Sawzall Recip Saw (2621-20), M18 6 ½ in. The 12V MAX Lithium drill is 35% more compact than previous GCO1200C NiCad drill/driver. This kit also includes a convenient bag or portability and storage. 11 Clutch Settings. 59 Hand Tools and Accessories. The 24 in. blade trims more material in a single pass, increasing reach and productivity. Cut capacity: 3/4 in. width: 0 x height: 0 x length: 0 x weight: 8.6. The 24 in. blade trims more material in a single pass, increasing reach and productivity. Cut capacity: 3/4 in. We do our best to process as quickly as possible. Garden Hedge Trimmer Steel Blade Durable Light Weight Metal Frame (Tool Only) M18 FUEL 18-Volt Lithium-Ion Brushless Cordless Hedge Trimmer (Tool-Only) The M18 FUEL Hedge Trimmer has the power to cut 3/4 in. branches, cuts up to 30% faster and provides up to 2-hours of run time per charge. Designed to meet landscape maintenance professional needs, the handle placement and weight distribution provide the best combination of balance and control. The trimmer features a slider-crank mechanism and all-metal gear case providing unmatched durability and longer life. The 24 in. blade trims more material in a single pass, increasing reach and productivity. The blade tip guard prevents damage to the property and the blades. The M18 FUEL Hedge Trimmer is fully compatible with 175 plus solutions on the M18 system.REDLINK PLUS intellige. Milwaukee M18 FUEL 18-Volt Brushless Cordless Hedge Trimmer Batt Chg Not Incl. The 24 in. blade trims more material in a single pass, increasing reach and productivity. Compatible with all M18 batteries. Part of the M18 system of 175 tools. Power Type Cordless. Assembly Required Yes. 5 out of 5 stars - Milwaukee M18 FUEL 18-Volt Brushless Cordless Hedge Trimmer Batt Chg Not Incl. 80 product ratings80 product ratings - Milwaukee M18 FUEL 18-Volt Brushless Cordless Hedge Trimmer Batt Chg Not Incl.